Born in Tula pr. 1917. Studied at Ryazan Art College 1934-38; INSTITUTE OF PAINTING; SCULPTURE AND ARCHITECTURE/REPIN INSTITUTE 1939-48. Active in Odessa, Ukraine. Began exhibiting 1948. Taught at Odessa Art College 1949-55. 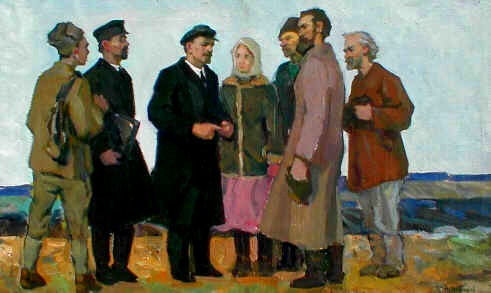 "Lenin with Farmers", oil on canvas, 46 x 77 cm, appr. 1960. "Portrait of the Leader", oil on cardboard, 50 x 46.5 cm. "Polling-Station", oil on cardboard, 107 x 75 cm.